← How to Convert PRN to PCX? To edit PDF creator means to edit PDF application. VeryPDF HTML Converter Command Line is a good document converter, which can be used to edit PDF creator and convert RTF to PDF via command in a swift and quick way. 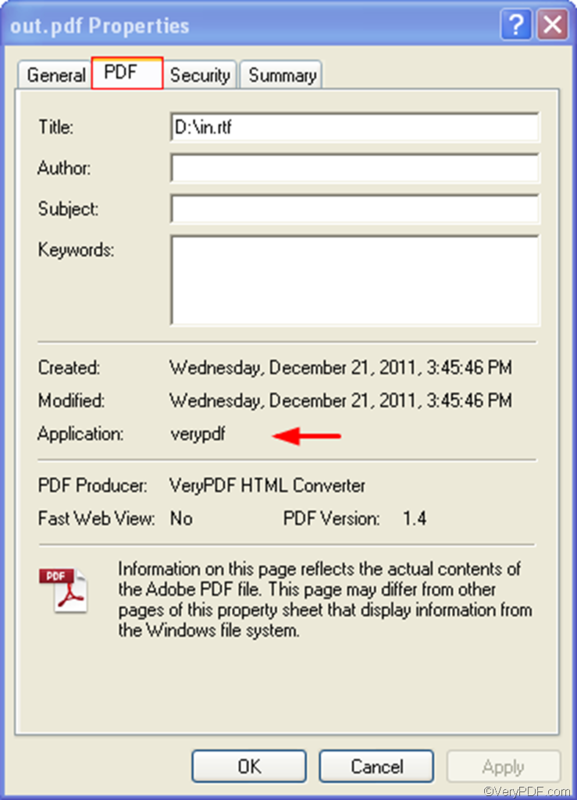 You can download it by clicking VeryPDF HTML Converter Command Line. This article would like to introduce how to edit PDF creator and convert RTF to PDF in three steps. Note the command line syntax below, which can help you find out what should be included in a command line. The angle brackets are used to enclose essential contents. string refers to character string. D:\htmltools\htmltools.exe ----represents the directory of the command line application of VeryPDF HTML Converter, which is stroed in the folder called htmltools on disk D.
-creator "verypdf" ---- can be used to edit PDF creator. Here, it defines PDF creator as "verypdf". D:\in.rtf ---- represents the input RTF file named in on disk D.
C:\out.pdf ---- specifies PDF as the output format. The output file name is out, and must be stored on disk C.
This entry was posted in VeryPDF Blog and tagged command line, edit PDF creator, rtf to pdf. Bookmark the permalink.